Let there be light, but let it be dynamic. Homes, offices, museums, boutiques, gardens can shine and put on new iridescent colors originating from LED lamps and spotlights. LED technology brings freedom to imagination and gives a new face to what has until now only been painted white. 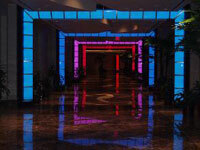 Walls, ceilings, facades, fountains, monuments can find a new life simply by projecting a beam of colored light. With the added advantage of fully customizable effects of variable color and light. In fact, spotlights and LED lamps can be connected to a DMX dimmer for the dynamic adjustment of the light that lets you switch instantly from static to dynamic light intensity. The controller can handle many scenic effects, adjusting the light intensity, the color of light and the transition from one color to another, thereby creating a uniform and spectacular illumination. 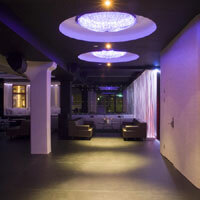 The LED inside the fixtures can also be fitted with various types of optics. When connect to the controller they create new colored or white light effects and exciting games of shadows, all from an easy to install and minimal footprint system. The RGB units can manage the lighting sequences generated by the LED lamps, either indoor or outdoor, create ambiance lighting with hidden spotlights, starry sky or flashes of light, dynamically adjust light on lamps placed on the bottom of swimming pools or on top of towers. A light as you've never seen it before.